Since 1992 Ginés Serrán-Pagán had been also painting in different regions of Australia: Byron Bay, Bluey's Beach, Sydney, Blue Bay, and Brisbane. In 1996, he rented a house at Indooroopilly, on the shores of the Brisbane River and made a series of paintings exhibited later on in Hong Kong and Tokyo. Nature was his companion and source of inspiration. In the garden of his house there was a big eucalyptus tree, home of a magpie family. The native Australian bird is known for its aggressiveness during the breeding season; there are numerous cases reported in Queensland of the bird attacking people on the head. Ginés used to paint outside in the garden and one day one of the babies fell from the nest into a rose bush and the mother couldn't save him because he was trapped within the thorns. With the help of a pole Ginés rescued the stunned chick and moved him to a safer place. 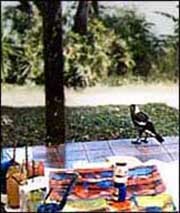 From that day on, and throughout the next several months, the artist was visited everyday by the magpie family.